Note: Thermal generation (power generated by fossil-fired, nuclear, and other steam turbines) is typically minimized in the Bonneville territory during the spring runoff. 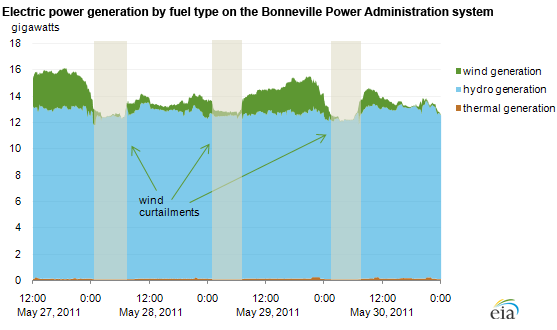 High levels of hydropower generation in the Pacific Northwest led the electric system operator, the Bonneville Power Administration (BPA), to curtail wind generation during some recent periods of low electricity demand. In accordance with their recently developed 'environmental re-dispatch' policy, BPA optimizes hydro generation to comply with Federal and State regulations protecting fish species along the Columbia and Snake Rivers, which in some cases means redispatching hydropower ahead of thermal or wind generators. Dam operators have regulatory limits on how much water they can "spill" over a dam. Spilling churns air into the water and increases the concentration of dissolved nitrogen, which can give fish gas bubble disease (like the bends). Since many of these fish are protected under the Endangered Species Act, as much water as possible is brought through the turbines to generate electricity, avoiding contact with air. BPA in its role as electric system operator must balance electric supply with demand, so overnight, when demand for electric power is low, BPA must decrease generation. BPA curtails hydropower generation as far as it can, but is constrained by regulations limiting how much water can be spilled over the dams. To further reduce the electricity supplied, BPA curtails generation from wind generators. Periods where wind generation has been reduced are highlighted on the chart. Curtailing wind generators reduces the production tax credit the wind plant operators would otherwise receive as renewable power generators (since the credit is a function of their generation). The hydro capacity in the Pacific Northwest generates large amounts of electricity when river flows are high, typically in spring and early summer, a considerably greater amount than is used within Bonneville's territory. 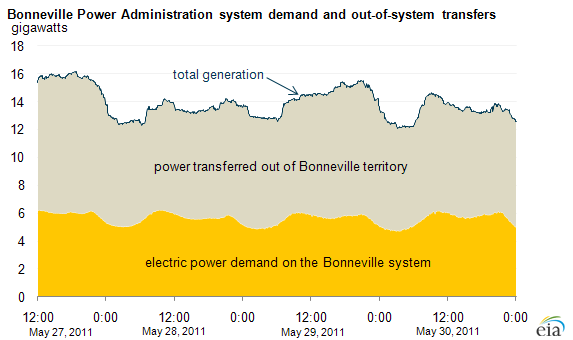 Excess generation above the Bonneville system demand is transferred to neighboring regions (for example, California), subject to transmission limitations. The Columbia Generating Station (the only nuclear power plant in the Pacific Northwest) has been offline for a refueling and maintenance outage since April 2, 2011. In past runoff seasons, the nuclear plant has been backed down due to high hydropower conditions.